We must assume that when Kit Watkins set out from his home in Maryland on the morning of 10 March 2001, he did not know that his journey would take him well beyond his original destination of Philadelphia. Certainly the road atlas indicated the route that would take him to St. Mary's church, the site of his Gatherings concert; but his course on this day would take him further - right up to the limits of his ability as a musician and straight into the heart of Saturday night. In March 2001, Kit Watkins performed his first live concert in 20 years. The Gatherings Concert Series hosted this event in the reverberant and reverential space of St. Mary's church sanctuary. Assembled were a number of Kit's faithful followers and friends intermingled with the greater community of electronic music afficianados - always eager to experience the music and talents exposed during the intimate process of creation. So it began that Kit opened his concert by approaching the stage from the rear of the church, walking among the audience while activating a hand held instrument. The emanations rose to the rafters and the space filled up with waves of metallic sound. At last Kit reached the stage area and, surrounded by a range of acoustic instruments and electronic gear, picked up his Electronic Wind Instrument (EWI) and began to play the delightful and pleasant "Morning Mothra". Holding the EWI, Watkins looks more like a reed player than the virtuoso keyboard player most know him as. In fact, much of his playing this night did not involve the tinkling of the ivories but rather the rubbing or striking of exotic percussion, the EWI and the looping and processing of sounds. While realizations like, "The Aftermath of Neglect" and "Tone 10" are slowly evolving pieces and involve sustaining sounds and textural nuance; pieces like "The Infinity of Three" and "Angels We Have Known" are focused compositions, conceived of well in advance rather than right on the spot. Other tracks are a bit of both. "Song For Russia" and "The Upper Regions of Space" seem to have an open quality to them and allow for many improvisational opportunities - whereby Watkins, in the moment completely, leads the piece to its ultimate outcome rather than following some predetermined course. The concert was incredibly well received by the audience. Watkins had provided an impressive and comprehensive evening of music: spacemusic that was intelligent and transported the listener inward right alongside more arranged melodic music whose style and physicality never took over as content. . . and most areas in-between. Casual observers of electronic music see only a homogeneous genre when actually there are many shades, levels and dimensions. So how rare it is to find, embodied in one individual, the range of styles and distinctions that make this music so fascinating. 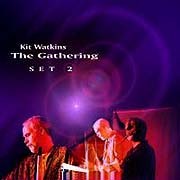 The albums The Gathering set 1 & 2 are the record of a very special evening we spent with Kit Watkins as he discovered his potential as a performing musician and his relationship with his audience. As if playing at The Gatherings event wasn't enough, Kit Watkins stepped out from under the heat and scrutiny of the stage lights, into the cool of the night as he continued his journey into sound with a post-Gatherings, late-night, in-studio radio concert live on STAR'S END, the weekly program of Spacemusic out of Philadelphia. 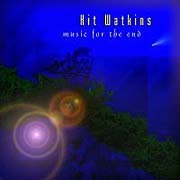 For this occasion, Watkins had conceived of performing a long-form, completely ambient piece entitled, "Music For The End (of Star's)" [inspired directly by the concept behind the radio program]. So, with a scaled-down setup of gear, the lights were dimmed and Watkins was ready to go on. The hour-long musical passage began at 2:00am. With little more than a few sounds and themes worked out in advance, Watkins focused on his mood and experiences. 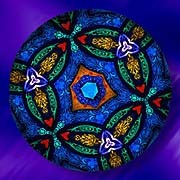 He established, then moved very slowly through a soundscape of tranquility and comfort. Synth pads undulated beneath the gentle melodies that arrived like a calm breeze from Kit's EWI. A sense of place was conjured up through the addition of wilderness recordings. The result was an encompassing, positive experience where we can be in contact with the ethereal side of Kit Watkins. His album, Music For The End is the recording made during this unique and wonderful session.